There is strong, internationally confirmed evidence for the short-term effectiveness of multimodal interdisciplinary specific treatment programs for chronic back pain. However, the verification of long-term sustainability of achieved effects is missing so far. For long-term improvement of pain and functional ability high intervention intensity or high volume seems to be necessary (> 100 therapy hours). Especially in chronic back pain rehabilitation, purposefully refined aftercare treatments offer the possibility to intensify positive effects or to increase their sustainability. However, quality assured goal-conscious specific aftercare programs for the rehabilitation of chronic back pain are absent. This study aims to examine the efficacy of a specially developed bio-psycho-social chronic back pain specific aftercare intervention (RÜCKGEWINN) in comparison to the current usual aftercare (IRENA) and a control group that is given an educational booklet addressing pain-conditioned functional ability and back pain episodes. Overall rehabilitation effects as well as predictors for compliance to the aftercare programs are analysed. Therefore, a multicenter prospective 3-armed randomised controlled trial is conducted. 456 participants will be consecutively enrolled in inpatient and outpatient rehabilitation and assigned to either one of the three study arms. Outcomes are measured before and after rehabilitation. Aftercare programs are assessed at ten month follow up after dismissal form rehabilitation. Special methodological and logistic challenges are to be mastered in this trial, which accrue from the interconnection of aftercare interventions to their residential district and the fact that the proportion of patients who take part in aftercare programs is low. The usability of the aftercare program is based on the transference into the routine care and is also reinforced by developed manuals with structured contents, media and material for organisation assistance as well as training manuals for therapists in the aftercare. Chronic back pain (cbp) is one of the most frequent reasons for rehabilitation assignment in Germany and associated with high socio-economical burdens [1, 2]. The main purpose of rehabilitation is the reduction of individual impairment of functions, activities and participation in social life [3–6]. Consistent with the ICF as underlying classification system in a bio-psycho-social understanding, the recreation of functional health as a key factor stands in the foreground of the efforts . In this sense, pain-conditioned functional ability and back pain episodes are important proximal goals, which in turn should improve also important, more distal outcomes like the restoration of workability and the enhancement of self-determination. In order to be able to plan the achievement of intended results systematically, regarding desired outcomes, rehabilitation must meet quality criteria concerning structures, processes and outcomes [7, 8]. Therefore, the choice of sub-goals, contents and methods should be based on the scientific proof of their effectiveness. the improvement of muscular stabilisation of the spine. Based upon the underlying evidence, these objectives are also considered to be important in current treatment recommendations [20–22]. For mediation of these sub-goals, exercise therapy takes an important part in the rehabilitation process of chronic back pain, holding a great proportion of overall rehabilitation time in Germany [23–25]. However, the verification of long-term sustainability of achieved effects is missing so far . For a long-term improvement of pain and functional ability, high intervention intensity or high volume, respectively, seems to be necessary (> 100 therapy hours), although it is not known in which period of time this volume has to be provided [13, 20, 24]. For the same reason of non-satisfying long-term evidence, general effectiveness of inpatient rehabilitation for chronic back pain in Germany has been put into question [11, 26]. In available national mainly uncontrolled studies, merly short-term rehabilitation effects with relatively low effect sizes are reported . To date, only Dibbelt et al. were able to report more constant higher effect sizes for a multimodal rehabilitation program . But these effects also were cut back in comparison to control group. As reasons for missing long-term effects of inpatient rehabilitation in Germany, different causes have been discussed by Hüppe et al., concerning masked effects, non-satisfying multimodal profile of treatment, missing individualization of treatment, insufficient treatment intensity and inadequate aftercare . Taking into account the high intensity or volume that seems to be necessary for the improvement of relevant outcomes in chronic back pain, the last two mentioned reasons deserve particular attention. Apparently, inpatient and outpatient rehabilitation intensity or duration is not sufficient to accomplish enduring effects on desirable outcomes in chronic back pain. Nevertheless, considering necessary adaptations in the recommended relevant target areas and specific sub-goals for effective rehabilitation programs, this is not really surprising. Within the typical scope of mostly three to four weeks of rehabilitative intervention in Germany, long-lasting adaptations referring to physical capabilities as well as health-related behaviour patterns may be initiated, but are hardly achieved to the full extent [27–29]. However, in the sense of recreation of functional health, exactly these adaptations in physical capabilities and in health-related behaviour patterns are assumed to form the basis of positive health benefits [6, 30]. Gerdes et al. go even further with their statement for rehabilitation aftercare in Germany . They postulate that the real rehabilitation process just begins after the institutional phase is completed. Purposefully refined aftercare programs offer the possibility to intensify positive effects of inpatient and outpatient rehabilitation or to increase their sustainability [31–33]. In order to be capable of answering these expectations, aftercare programs should aim at the intended outcomes systematically [7, 8]. Therefore, implicit or explicit assumptions about the intended impact, processes must involve the relevant determinants of desired change in appropriate intervention programs . Until further notice, for chronic back pain these determinants concern foremost the same objectives, target areas, contents and methods that have proven to be relevant or effective, respectively, in the institutional phase of rehabilitation as postulated in current recommendations and described above. Although in order to contrive durable effects, the relevance of strategies to encourage adherence to health-related behaviour increases. For aftercare interventions the specificity concerning the mentioned determinants inherently supposes an alignment at the necessities of chronic back pain as medical indication. Nevertheless, no indication-related, quality assured, specific aftercare program currently exists for persons with chronic back pain in Germany. This indicates the need for the implementation and evaluation of a suitable, indication-related, quality assured aftercare program. For the purpose of implementing an aftercare program for chronic back pain, exercise therapy offers a broad approach, because of its inherent multidimensional structure. As a main therapy module in general rehabilitation as well as in rehabilitation of chronic back pain, it could provide improvement of pain-conditioned functional ability and back pain episodes by mediating adaptations in the relevant target areas. Furthermore, an exercise therapy based aftercare program, completed with parts of motivational and volitional aspects, has the potential to produce enduring health enhancing effects by persistently increasing health related physical activity [28, 29, 34]. On the basis of this assumption, an aftercare intervention relying on an existing modular concept was developed [35, 36]. This aftercare program (in German: Rück enge sundheit - Wi rksamkeit bewegungs- und verhaltensbezogener In terventionen in der N achsorge, RÜCKGEWINN) obeys existing quality criterions and current recommendations for interventions with chronic back pain based on scientific evidence and should therefore improve the individual success of treatment [20–22, 37]. The main purpose of the present study is to examine the efficacy of the developed bio-psycho-social aftercare intervention program for chronic back pain (RÜCKGEWINN) in comparison to current usual aftercare (IRENA) and a control group that is given an educational booklet addressing pain-conditioned functional ability and back pain episodes. Secondary objectives concern the program induced changes of other factors relevant for active self management, for example pain-related cognition like catastrophizing, or physical activity, and their influence on the mentioned primary outcomes as well as their efficacy controlled for empirically proved risk factors (yellow flags). An additional objective is the illumination of mediated operant mechanisms of the aftercare programs. The study is designed as multicenter prospective randomised controlled trial in a three-factorial, split-plot plan (3x3xn) characterized as profile analysis (Figure 1) . 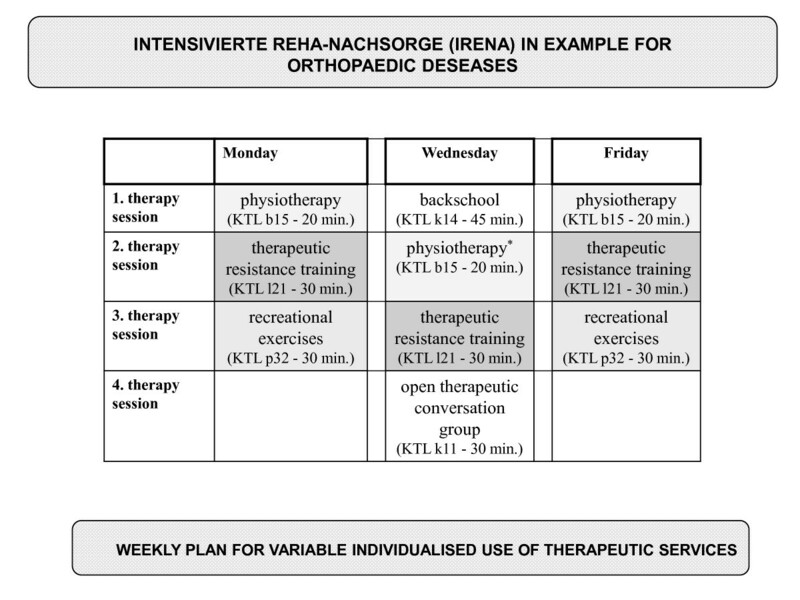 Thereby "aftercare treatment" appears as whole-plot factor with three categories respectively study arms (booklet, IRENA, RÜCKGEWINN) crossed with the sub-plot time factor that has also three categories (before and after rehabilitation and 12 month follow-up) . The aftercare treatments will be carried out between 2nd and 3rd measurement. The third factor is the nested patient factor and is treated as random . In addition, we stratify and control the trial for the covariables "chronicity staging", "gender", "rehabilitation facility" and "aftercare facility". Therefore, these covariables appear as additional factors. Study design and planned/expected number of cases according to CONSORT Statement. Primary outcome is pain-conditioned functional ability as a direct expression of disability and core outcome component in treatments for chronic pain, measured with the Hannover Functional Ability Questionnaire (FFbH-R) [41–43]. The FFbH-R consists of 12 items with a three-stage answering scale. Its summary score describes the back pain-related functional ability in activities of daily living (ADLs) in adults on a scale of 0% (minimum functional ability) to 100% (maximum functional ability). The questionnaire is constructed for response to already light and moderate functional restrictions. The average item-intercorrelation amounts to 0.50. The test-retest-reliability with repeated measures after approximately one week is above 0.75. Cronbach alpha figures 0.90 . The one factorial structure of the instrument could be confirmed in a principal component analysis. The comparison with related constructs and instruments (Health Assessment Questionnaire, Roland Morris Questionnaire, MOPO scales, Pain Disability index) resulted in steady correlations of 0.75 and greater. Secondary outcome is the average pain intensity during the last six month measured with a NRS (numeric rating scale) ranging from 0 to 10 [42, 44, 45]. As sensitivity analysis the von Korff pain grading system is used, which also includes constructs of pain-conditioned functional ability and pain intensity . Further, secondary outcomes refer to factors relevant to active self management and address cognitive, emotional and behavioural coping strategies, physical activity and aftercare adherence behaviour. The latter includes motivational and volitional factors, depression, quality of life assessment, social demographic variables and days of sick leave. All outcomes and the way they are measured are shown in table 1[43–62]. Additionally, for each lesson, the participants' attendance and their perceived disability on a one item NRS is assessed in the two active study arms . Eligible patients are randomised and allocated to either one of the three aftercare treatments. To support the participant's recruitment process, a flow chart and a guiding paper was generated and provided to the clinic practitioners and staff. The sample size calculation was approximated with a 3x3-factorial ANOVA-approach based on the primary outcome and was done with the software "gpower 3.1" [63, 64]. To prove an intervention effect with about medium effect size of Cohen's f = 0.27 with an error probability α = 0.05 and power β = 0.8, n ≈ 68 people in each study arm are required for analysis . This was calculated in view of the chosen factorial design with m = 8 estimated fixed parameters. With a supposed drop-out rate of 40% within the progress of the interventions, we need 114 participants in every study arm to begin the assigned aftercare intervention. In addition, we assume that 75% of all participants that were recruited from inpatient or outpatient rehabilitation will start out well with their assigned aftercare treatment. So we need to recruit 152 participants in every study arm or 456 for total sample size (see also Figure 1). In consideration of the logistic situation with several external and internal recruiting rehabilitation facilities and the provision of aftercare in diverse residential areas with miscellaneous aftercare patients in each aftercare facility, specific demands arise for the data management and the randomisation procedure. To accomplish a realisation with high scientific quality, we chose a largely electronic and internet-supported solution for data management including an online-randomisation feature. We implemented a data base for partly electronic data capturing where participants and patients not participating with the right inclusion diagnosis must be registered by the rehabilitation practitioners via a web-application. For an estimation of the participation ratio, all patients who meet one of the inclusion diagnoses are counted anonymously, independent of their participation in the study or any exclusion criterion. Registration of participants must be done before allocation is accomplished by the study software, so allocation concealment is assured automatically. For sequence generation we used an urn randomisation algorithm . This algorithm is the most widely studied member of the family of adaptive biased-coin designs and provides a good compromise between controlling multivariate experimental bias and balancing the trial . Advantages are good statistical properties, which force a small sized trial to be balanced and approaching complete randomisation as the sample size increases, with less vulnerability to allocation bias than permuted-block design. Consequently, an additional practical capability arises. The urn randomisation allows stratification for either large or small number of covariables with unknown prevalence. In this trial we stratify the randomization for "chronicity staging" with 3 subcategories, "gender" with two subcategories and "rehabilitation facility" with six participating centres. Further purpose of the electronic data management system is that, as a planning tool and tool for data transfer and communication with corresponding facilities, it allows to support the organisation of the aftercare groups. All participants in this study arm will receive an educational booklet from their rehabilitation practitioner in their dismissal examination as well as the advice to return to normal activities as soon as possible. As educational booklet, the German version of the "back book" of Burton et al. was chosen . This booklet provides information about the new approach to back pain, causes of back pain, dealing with an attack of back pain, risk factors for development of chronic back pain and the role of activity. All information that is provided is in accordance with up-to-date scientific knowledge and is based on a bio-psycho-social model of back pain like described in Waddell . All participants in this study arm will be introduced into the normal IRENA program (in German: Intensivierte Rehabilitationsnachsorge), which is usual care in Germany . Every patient will be assigned to a certified outpatient aftercare facility near their residential area. Aftercare practitioners and patients can compile an individual therapeutic package from certain appointed therapeutic services . Predominantly resistance training, gymnastics, aquatic exercise, back school and recreation exercises are prescribed by the physicians for aftercare. Most therapies are carried out in open access groups of at least 6 patients without being specific for medical indication. In the IRENA program it is possible to pass the intended 24 exercise sessions with varying frequency per week. Usually, participants complete two or three exercise sessions per week with duration of 90 to 120 minutes per session. Every aftercare facility offers specific therapy combinations at different days a week. Figure 2 shows a weekly therapy plan offered by one of our cooperating facilities. We determined the duration of RÜCKGEWINN at 6 months, taking into account the time necessary for the process of behavioural change. In order to have an equal number of sessions compared to IRENA, one session is scheduled weekly for 26 weeks. RÜCKGEWINN will actually be provided in two phases, with the first carried out in 10 consecutive sessions in closed groups. We chose the closed group form, because it is more appropriate to appeal on relevant factors of behavioral change, especially in terms of coping strategies and physical activity enhancement. For anticipated organizational reasons, the second phase of 16 sessions is planned as open access group with partly repeating contents, with the goal set at the participants' empowerment to regular self-determined health enhancing physical activity. We developed a RÜCKGEWINN manual for therapists and provided some media like for example little ring binders with information cards for participants that will be handed out consecutively each session. We trained several therapists from cooperating certified aftercare facilities to our curriculum. Every patient of this study arm will be allocated to one of those facilities as close as possible to their residence respectively subject to their choice. Ii denotes the indicator variable for IRENA aftercare treatment and Ri the indicator variable for RÜCKGEWINN aftercare treatment of individual i in a dummy coding with "booklet control" as reference category . The corresponding β 2 and β 3 reflect directly the difference in "slope" of IRENA respectively RÜCKGEWINN to reference "booklet control" and for that reason the efficacy. AF an RF are dummy coded expressions for aftercare respectively rehabilitation facility of patient i, MPSS is also dummy coded variable for chronification stage according to Gerbershagen and G is a dichotomy gender variable. T denotes a suitable construction term for the b-spline for the additional effect (slope) of rehabilitation phases . As shown in the specified model, we consider the stratified analysis to be the primary analysis carried out with the corresponding intention to treat collective. Other analyses are conducted as sensitivity analyses. To address secondary objectives of the study, the change of secondary outcomes in different aftercare treatments is also assessed. 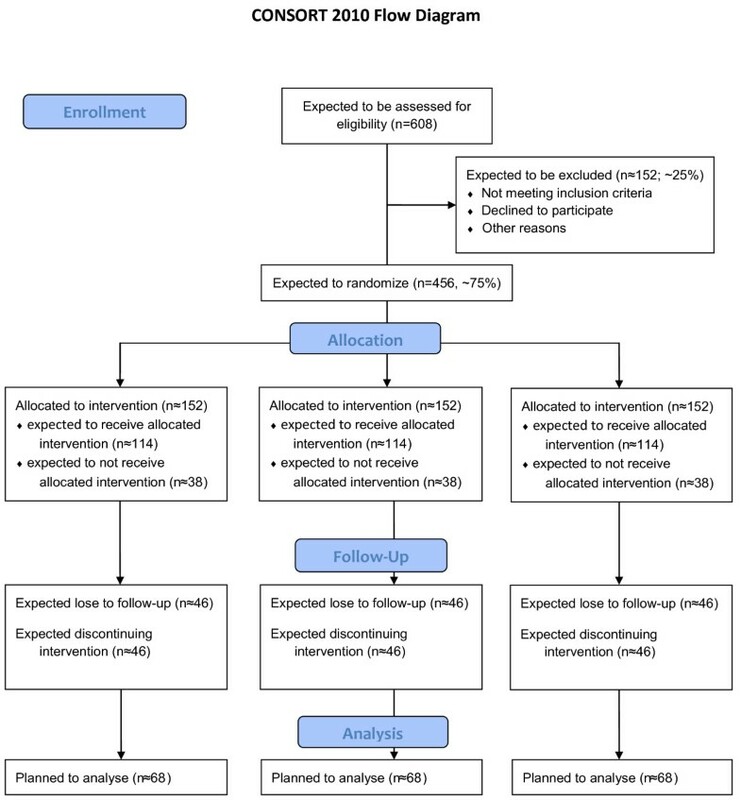 In order to identify effective components or partial goals that should be targeted in aftercare exercise programs, the time varying influence of secondary outcomes on the primary outcomes in the different treatments is modelled by multiple regression modelling. The study sponsor being the Deutsche Rentenversicherung Bund (German Federal Pension Fund), which has an official assignment, this study inherently has to accomplish high ethical demands, especially in aspects of data privacy. Additionally, this investigation has been approved by the independent Research Ethics Committee of the Medical Faculty of Friedrich-Alexander-University of Erlangen-Nuremberg on 09.06.2009. Chronic back pain comes along with a hardly mastered individual disease burden and intrusively affects all areas of life negatively. It has critical consequences on social and occupational participation and causes serious disability. Empirical evidence encourages the relevance of theories for the chronification process of back pain that demand mutually increasing physiological and psychosocial factors that surpass simple additive effect structures (e.g. fear-avoidance model). Thereby, it was shown that particularly by exercise-related and behaviour-related interventions, the appearance as well as the duration of future back pain episodes can be decreased [74–76]. Multidimensional concepts, which combine physical training with cognitive-behavioral components in a bio-psycho-social approach, are appreciated as especially promising . Newer randomized controlled trials confirm these results [77–82]. Thus, we assume that the implementation of a specifically refined aftercare program with a high extent of therapy hours after a stationary rehabilitation leads to a stronger empowerment and a stronger development of self management competence than usual aftercare programs. In detail this should result in reduction of fear-avoidance beliefs as well as maladaptive coping strategies and, on the other side, in enhancement of self-efficacy, a stronger identification with and adherence to physical activity and, as a consequence, a reduction of deconditioning, and a sustainable encouragement of adaptive cognitive and behavioral coping strategies. Hence, we expect substantial and lasting improvements for the majority of the intervention group in view of pain-conditioned functional ability, pain intensity, pain-conditioned psychic disability as well as for subjective general quality of life. The beneficing of a back pain specific aftercare program therefore is obvious, and lies in the transference into the routine care and is also given by developed manuals with structured contents, media and material for organisation assistance as well as training draughts for therapists in aftercare. Despite the possible high benefit for chronic back pain rehabilitants, special methodological and logistic challenges accrue in this study. A major logistic problem could possibly arise from low rate of patients that begin their prescribed aftercare. In usual aftercare this rate is about 18% concerning inpatient and about 43% concerning outpatient rehabilitation . In this context we have to consider that once patients get back home from rehabilitation, the participation in an aftercare program collides with responsibilities of their daily life. In order to enhance the participation rate, we try to increase the liability of the aftercare for patients with a pre-registration in an aftercare facility when they are still in rehabilitation. We would like to thank all members of the Deutsche Rentenversicherung Bund (German Federal Pension Fund), who support us in the implementation of the study. We would also like to acknowledge all of the general practitioners and practice nurses and secretaries who are engaged in participating clinics and for feedback on how to translate our study protocol into a model that will work in the challenging environment of rehabilitation care. In this scope we would like to grant special appreciation to CA Dr. Manfred Büdenbender and Sabine Nehling (rehabilitation facility "Lautergrund"), CA. Dr. Manfred Milse and Andrea Grabe (rehabilitation facility "Dübener Heide"), CA Dr. Matthias Krause, Mrs. Quasdorf, Mrs. Raudes, Mr. Jeckel and Michael Maron (rehabilitation facility "Median Klinik Hoppegarten"), CA Dr. Bernd Johnigk, Mrs. Wetzel, Mrs. Peschl and Angela Berg (outpaitent rehabilitation facility "ZaR Berlin"), CA Dr. Tillman Stock, Melanie Ulrich, Sigrun Dybvad Funke and Steffi Höft (rehabilitation facility "Vivantes Rehabilitation"), CA Dr. Karen Bienek, Michael Warmbold and Kerstin Born (rehabilitation facility "Tagesklinik Pankow"). Last but not least we like to thank Alexander Tallner for proof reading. CH drafted this manuscript and contributed substantially to the final development of the study protocol and study design as well as to the particularizing of the research question relying on the relevant literature. CH was responsible for planning and working out methodically aspects of the study, including e.g. patient enrollment, randomization, assessment and statistical analysis. CH was accountable for planning the implementation of the study, ethical aspects, and data management. CH also contributed to develop the experimental treatment. JH contributed to develop the research question from national and international literature. JH was responsible for the selection and compilation of the employed questionnaires according to the chosen primary and secondary outcomes. JH contributed to develop the experimental treatment. KP conceived the study and was responsible for identifying the research question beforehand. KP drafted the study design and was accountable for determining primary and secondary outcomes. KP contrived the basis for development of the experimental treatment. All authors red and approved the final version of the manuscript.